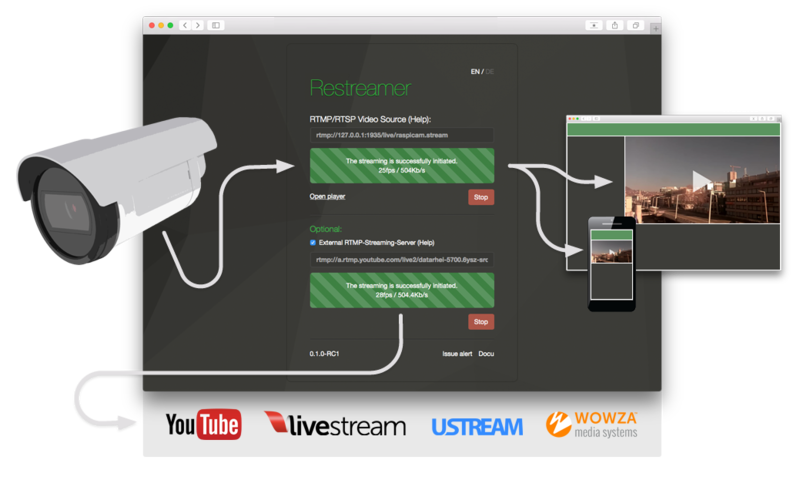 The Datarhei/Restreamer allows free video streaming. The H.264 video is displayed via iFrame on the website. Even the video player is included. There is no streaming providers required and there are no monthly fees because your own internet connection is used for streaming. It can be streamed to external video services like YouTube Live, Ustream, Twitch or Livestream.com to use these services as a distributor for your video, too. Streamingservers like WOWZA or Adobe Media Server are supported. Our Docker image is easy to install and runs on Linux, MacOS and Windows. Datarhei/Restreamer can be perfectly combined with single-board computers like Raspberry Pi, Pi Zero and Odroid. The elaborate installations and configuration of the needed programs to stream a camera, falls completely away with the Restreamer. 1. Raspberry Pi camera and USB cams are not implemented in the UI yet, you have to activate them over a sweet and easy hack. 3. The installation of Dockerfiles requires some time while a complete image is rolled out. Once this process is running, you can sit back and go drink a coffee. Depending on the CPU power of your computer, the process may take some time. 4. Please do not forget to forward port 8080 in your router, as described in the instructions to forward (port forwarding), if you want to use the iFrame code on your website. Everyone is very welcome to use the Webchat or our Forum for questions around the Restreamer on Google Groups. In our Wiki some questions about the technical aspects of Live Streaming are already answered. You can also make comments in this beautiful raspberrypi.org forum. PS: If you like software development, can also forks on GitHub and start developing - Everyone is welcome, there is always something to do!